Jane McKay, has been a member of Craft in Action for 8 years. 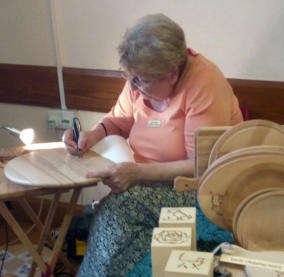 A wood turner and pyrographer, Jane lives in Gloucester with her husband and has been turning wood for 11 years, and has done pyrography for about 8 years. Her interest in wood has been there for many years, even as a child she got under her father's feet when he did jobs around the house! 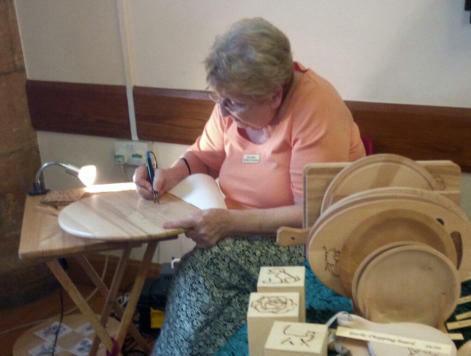 While still working full time as a teacher, Jane began carpentry lessons at Gloscat, making many useful items for her family and it was there that she made her own, rather large, workbench! It was during these sessions at the college that she first saw woodturning, and was hooked almost instantly! A friend allowed her to practise on her lathe, until she felt ready to buy her own. After that, it was a matter of 'keep making shavings', which is pretty much a constant in her life. Holidays are fine, but after any more than a couple of weeks, there is a strong yearning to turn again!